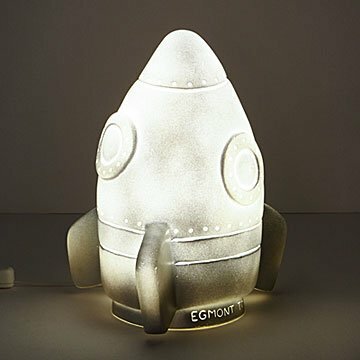 Send their dreams soaring into space with this adorable little rocket ship lamp. When this rocket grows up, it wants to go to Mars just like its parents. But for now, it's happy lighting your little one's way when the sun goes down. Send their imagination blasting into space with this adorable mini spaceship lamp. When lit up, the metal design emits a soft, warm glow from its interior so they can find their way at night. Great for astronauts- and enginners-in-training, it's sure to inspire celestial dreams. Made in Belgium.